P&amp;O Port’s main Sydney Terminal. A clever partnership between P&O Ports and KCI Konecranes have kept containers flowing uninterrupted at P&O Ports’ Sydney terminal while three of the cargo handlers' major cranes underwent major refurbishment. Rather than taking three Krupp twin hoist portainer cranes out of service for months, P&O drew up a modular refurbishment program enabling the work to be progressively undertaken within tight timeframes to avoid major service outages. After 25 years loading and unloading container vessels, the heavy cranes needed major maintenance and upgrades to achieve maximum efficiency at a time of expanding demand, but it was essential the refurbishment did not affect the constant flow of containers in and out of the terminal. The company's Engineering Projects Manager for Australia and New Zealand, Steven Tull, found when he originally called for tenders for the full refurbishment of just one of the Krupp cranes that it would take more than 100 days to complete the work. "It was not possible to schedule this level of disruption to the operation of the terminal, so the work was deferred," he explained. So firstly P&O arranged renewal of the contractor of the electrical systems in all three of the Krupp cranes, which operate alongside each other at one end of the main terminal wharf. The analogue drive systems were replaced with the latest dc drives, the PLCs were changed and new drivers' consoles and chairs were provided to improve operators' comfort and safety. "Ancillary items like all the machine house brakes, the long-travel gantry gearboxes and sheaves and headblocks also were replaced or renewed on all three cranes," said Mr Tull. "We then embarked on the assessment of a modular approach to the remaining refurbishment of the three Krupp cranes. P&O had crane performance and safety priorities and needed to undertake the most effective work program within the shortest outage window possible." 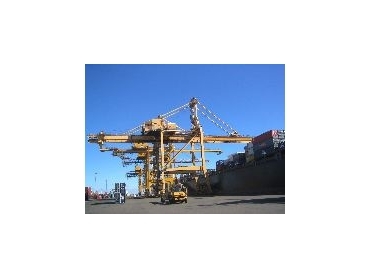 P&O invited tenders for the project and subsequently selected KCI Konecranes to undertake the work. KCI Konecranes has more than 230,000 cranes of all makes under service contract worldwide, including more than 10,000 in Australasia. KCI Konecranes - which is the world's largest crane manufacturing and service organisation - last year named its Australian operation as its Service Company of the Year. "Three years ago, KCI Konecranes were commissioned to service the passenger lifts in our six quay cranes," said Mr Tull. "It was a performance-based contract in which KCI Konecranes performed admirably. As a result they were invited to undertake several non-core backlog maintenance and improvement works that also were completed to our complete satisfaction." In August last year, KCI Konecranes was commissioned to replace the XT rails, trolley wheels and side-thrust rollers on the furthermost Krupp crane, the QC001, which was parked at the eastern end of the wharf rails. New 'smart' spreaders also were to be fitted. Twenty-one working days, including contingencies, were allowed for the work. "Whilst not considered a terribly challenging job, once the rails were removed the beam was coated with special Belzona metal epoxy product," explained Mr Tull. "During this work, the Konecranes’ technicians also repaired other miscellaneous components. Even with unexpected additional work, the Konecranes team did a fine job within the agreed period and subsequently Konecranes was invited to schedule the same work on Krupp cranes QC2 and 3. Mr Tull said KCI Konecranes managed to complete their work on time with significant cost savings.